This is the finished Coop. The wheels are from Harbor Freight. These are 10" pneumatic. I have found that this is a little small to move easily. I would opt for a larger size, but these are inexpensive. 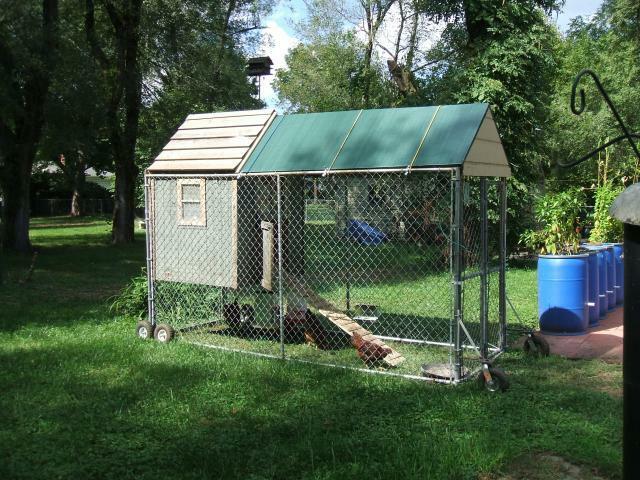 The coop itself was a playhouse sold by Lowes. The only real modification was the addition of a floor made out of cedar. Plexiglass was added to the windows for protection from the elements. The sides are a dog run that measures 4' x 12" x 6'. It is a convenient size. I have 6 hens and in one day they pretty well graze off the area. The top cover is a simple 2"x2" lumber frame with a plastic tarp stapled to it. It is very light weight, but gives protection from rain. Later I will attach a tarp to the North and West side for protection from the elements during the winter. Nest boxes are attached to each side of the door and are 1' square. I think a cat litter box may have worked better.